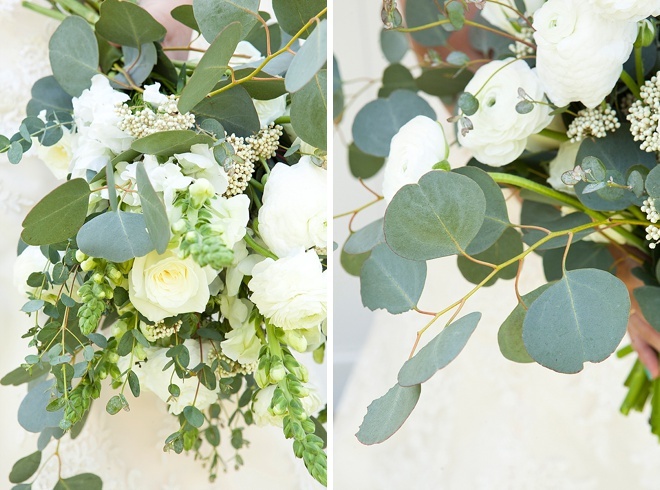 Eucalyptus not only smells delightful… but it looks lovely, it’s cost effective, and holds up wonderfully without water – which means it’s like the ultimate foliage for a wedding bouquet. 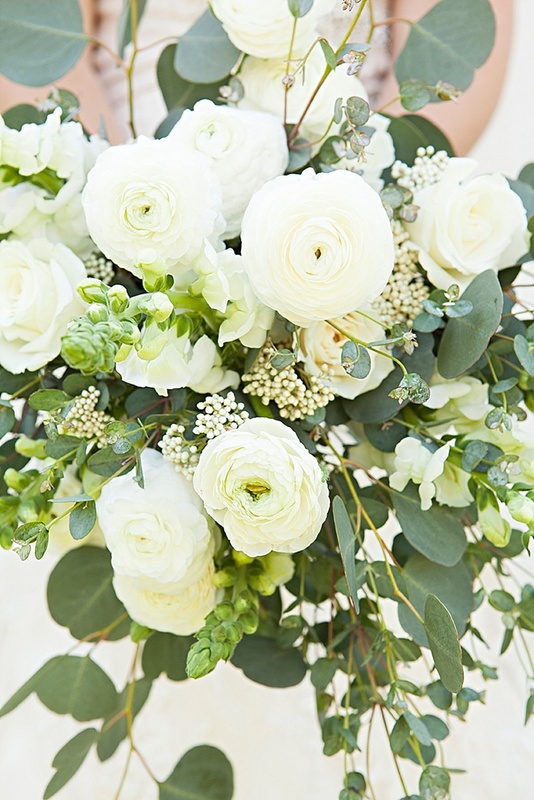 In today’s lush, organic style Bouquet Blueprint Jacki from Floral Designs by Jacqueline Ahne makes liner flowers look ultra fab and wows us with this green and white color palette. 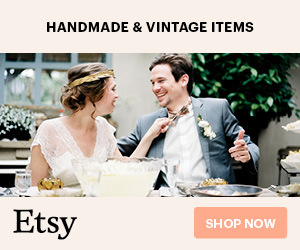 This design would be a wonderful choice for the romantic and earthy bride who wants her bouquet to move with her down the aisle. 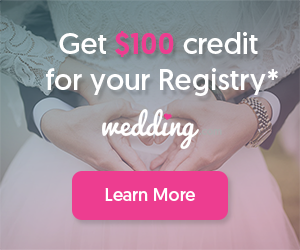 Another great thing about eucalyptus is that it reflects light in many different shades, from dark and light greens all the way to soft gray, creating a multitude of hues in your photographs! 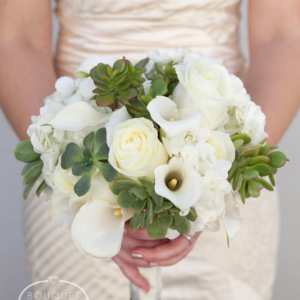 The base of this bouquet is available year round. 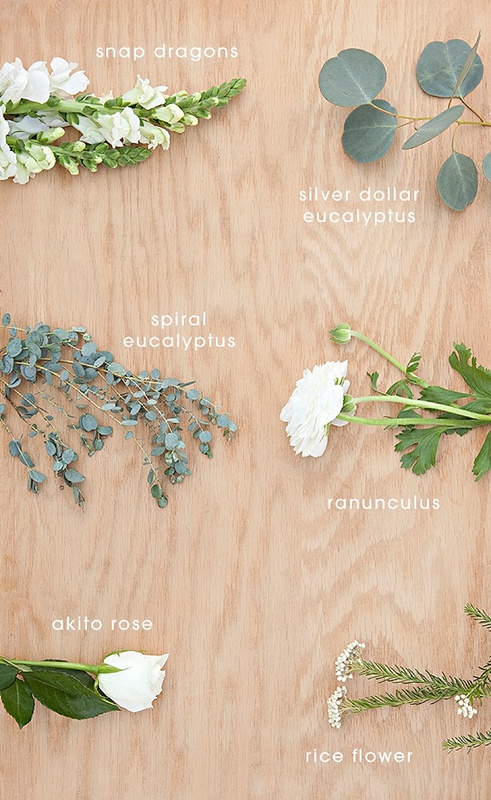 The only flower that is really seasonal is the Ranunculus. It is available year round in limited supply with the peak season being spring through summer. Rice flower is also only available spring and summer (based on weather conditions). A good substation for rice flower would be max flower or million star babies breathe. 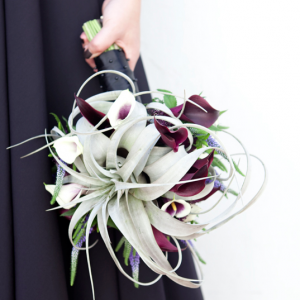 One of the main advantages of having a mainly foliage bouquet is that foliage usually lasts very well out of water. 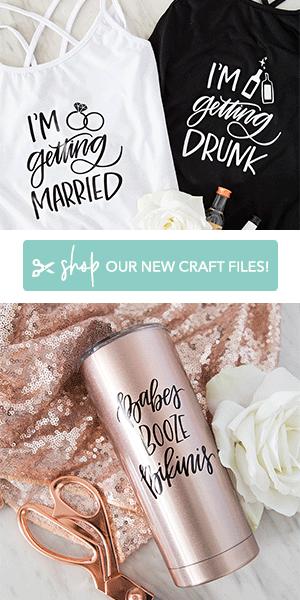 This bouquet is no different! 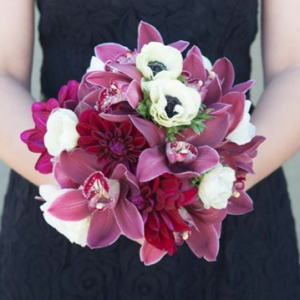 The flower choices that were made can withstand being out of water for many hours; however to keep them looking the very best it is a good idea to leave them in water as long as possible. 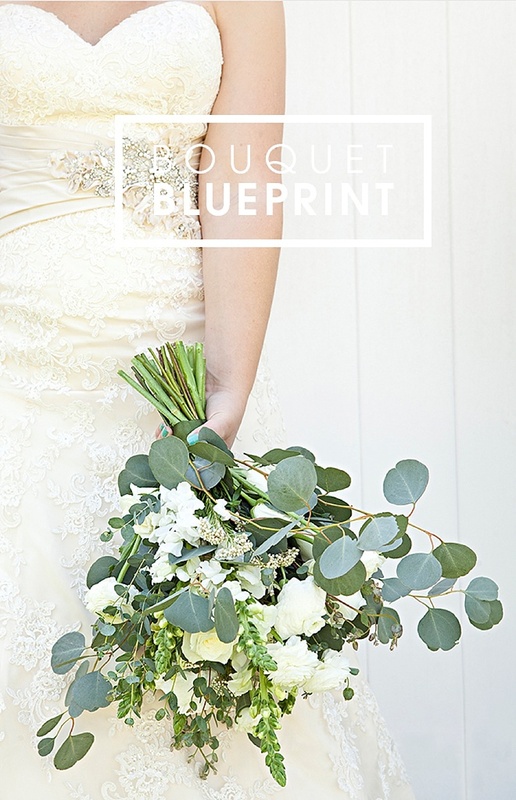 Traditionally bridal bouquets are created mainly with mass flowers however this bouquet incorporates many stems of linear flowers and foliage like the silver dollar eucalyptus and the snap dragons. 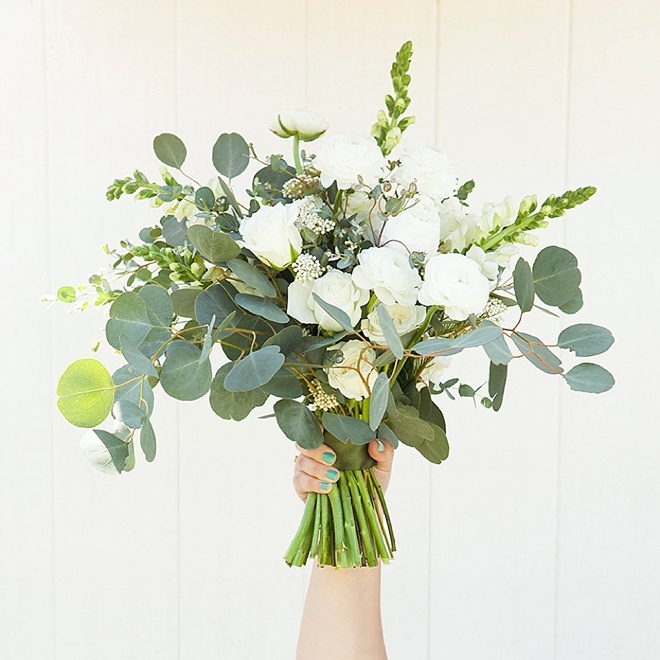 It can be difficult to use linear flowers in a bouquet because they can be too tall or too stiff, making for an awkward looking design. To overcome this issue, be sure to pick flowers that are delicate enough to have movements to them. 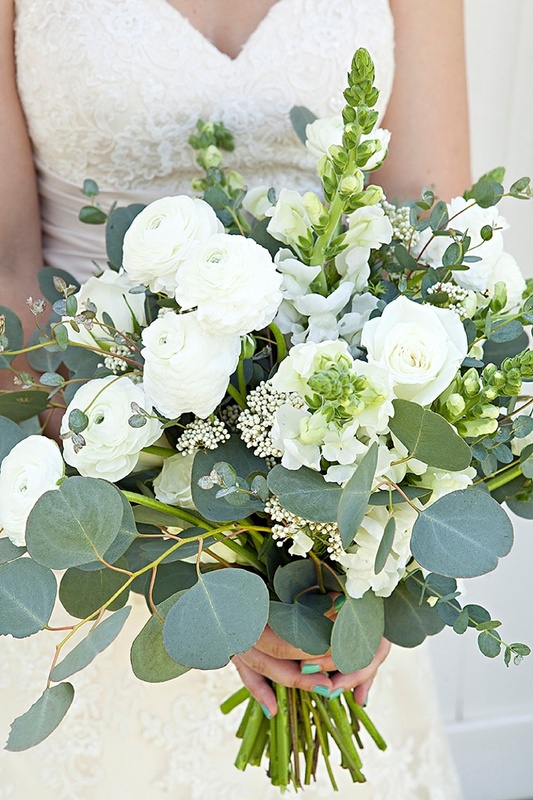 The eucalyptus has such a great movement when this bouquet is carried down the aisle and the snap dragons have a slight curve in them which gives a softer look. 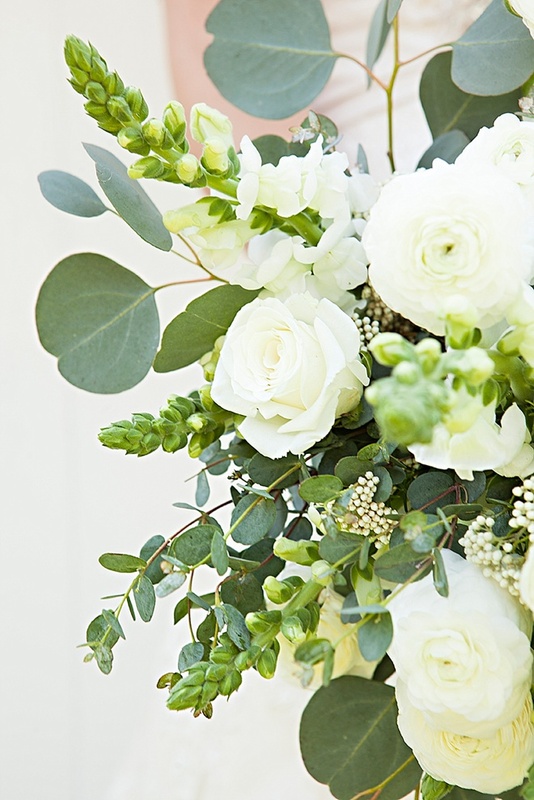 There are many benefits to using linear foliage in the bouquet such as cost. 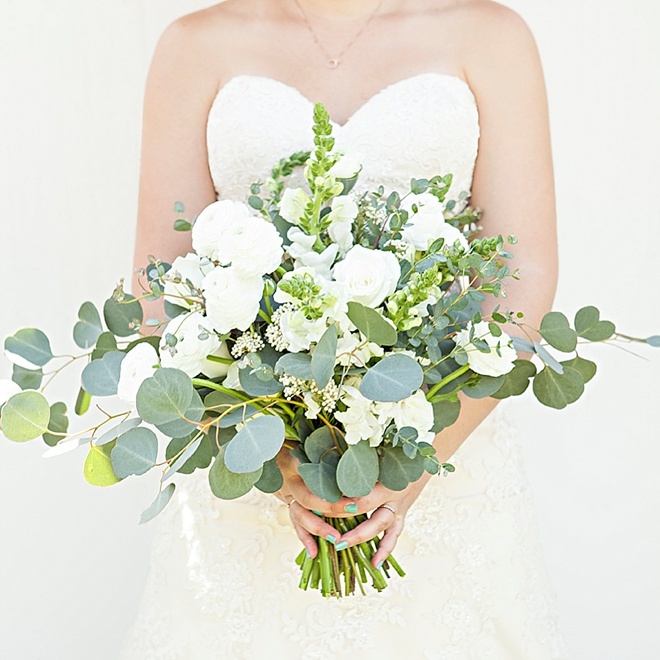 The foliage allows for the bouquet to be a larger over all look without needed as many stems which is very cost effective! 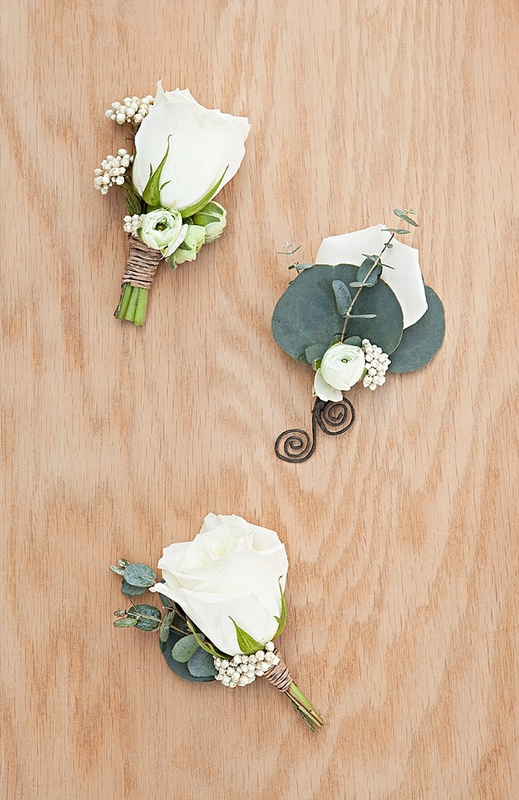 From the traditional to the modern, these boutonnieres shown are very versatile and would coordinate with many styles of bouquets! The “akito” rose is one of the best for boutonnieres because it’s lightweight and has a smaller bloom size then many roses. This makes it much easier to pin on securely and not loose it’s shape by movement throughout the event.